Grooming your dog is essential in maintaining his healthy and clean state. On top of bathing and brushing your dog, it is vital to give him an occasional hair-cut, especially if he is the furry type. The duration between the cuts will depend on the kind of dog and how fast his hair grows. Creating and keeping a pet grooming table will assist you to keep your dog calm and still while you are making your dog look good, as advised by experts. Note that not all dogs need a hair-cut, and for those that do, this simple practice can be done from the comfort of your home. Cleanliness. It gets easier to groom a dog when the hair is not extremely long. The main reason for grooming your pet is to keep him clean and smelling nice. Shampooing gets more comfortable with manageable hair length. Keeping pests away. 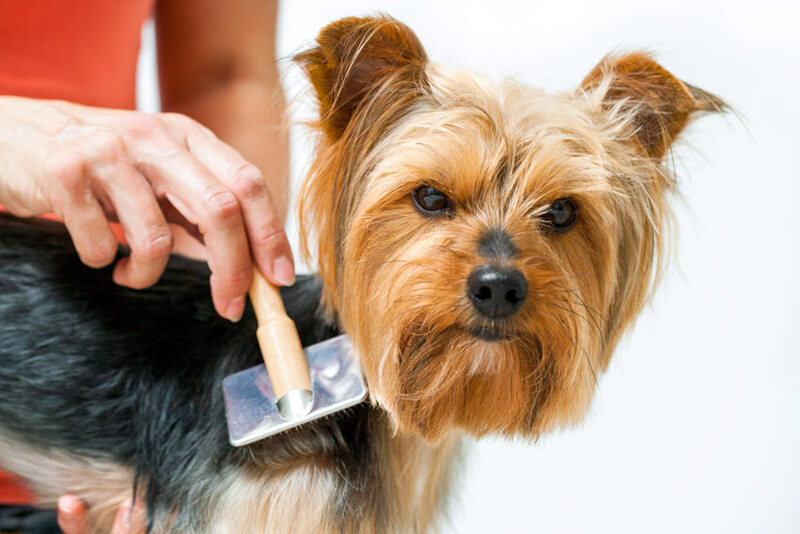 Cutting the dog’s hair helps prevent the existence of pests and inhibits their spread. This, in turn, enhances the health of the dog by reducing the chances of infection from pests like fleas and ticks. Ease of hearing and seeing. Sometimes the dog hair grows long until it covers the dog’s eyes and ears. This interferes with his sight and hearing and can be very uncomfortable for him. Regular hair-cuts will remove the extra-long hair and let your pup be at ease. As mentioned, not all dogs need hair-cuts. For those that do, so many things vary. Hair length. Long hair is cut differently from short hair, and the tools used on long hair vary from those used to cut short hair. Long hair is best cut using scissors while short hair is easy to trim using a grooming clipper. Hair texture. Some dogs have soft fur while others do not. Different fur textures tangle differently and demand different attention details. Dog clippers usually slide over soft fur and may not be the best for the job. Scissors, on the other hand, are manually operated and can cut any hair type. Experience. Depending on your level of expertise, some tools are applicable when cutting your dog’s hair. Clippers are easier used by not-so-confident groomers because with scissors a small distraction can cause harm to your dog. The most important part of trimming your dog’s hair is preparation. 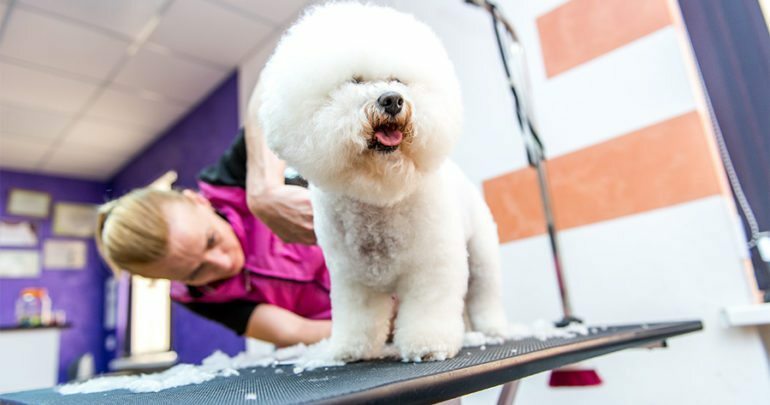 Depending on your dog’s hair type and length, gather all the requirements; clippers, a pair of scissors, a comb, rounded safety shears, thinning shears, dog brush, warm water, shampoo and hair drier. Set up a working spot and ensure all the tools are handy. Prepare your dog psychologically by talking to him and letting him know it is grooming time. Most dogs may get ballistic at this time, and it is essential to give them time and positively reinforce them so that they embrace the exercise. Step One: Bathe your dog. Bathing your dog before shaving ensures that the fur is clean and as much as possible tangle-free. Use warm water and your regular shampoo. Ensure the hair is lathered up fairly before rinsing off the foam with warm water. Next, dab up your pet with a clean towel to get rid of the excess water. Step two: Dry up your dog with a hair drier. Using a regular hair drier, blow at the fur of your pet using one hand while stroking it with your other hand to dry up his hair completely. It is much easier to cut dry hair as opposed to wet hair. When blow drying him, begin with the rest of the body and finish up with the head area so that you do not make your dog anxious. Step three: Brush the hair. Using the dog brush, brush the hair of your pet evenly to get rid of any tangled spots. In case of a tangle, hold it at the root firmly with one hand and work the knot slowly without tagging excessively at the dog’s skin. Ensure you brush the legs and the head areas too, including the ears and the tail. Step four: Shaving. If you are using dog grooming clippers, choose the best blade from a wide assortment in such a way that the clipper leaves about two or three-centimeter allowance between its edge and the dog’s skin. Also, if possible use a low noise clipper as louder clippers can make your dog more anxious. Run the clipper gently on the hair without pressing too hard on the dog’s skin. Start from the neck area down to the body on one side, careful not to apply too much pressure. Turn to the other side of the body and repeat the exercise. Use a comb to ensure evenness by brushing gently to see areas that need more cutting. Remember the general rule; do not shave against the grain. Next, shave the belly of the dog as gently as ever, carefully running the clipper while holding your dog to prevent too much movement. Proceed to the legs in the same way careful not to apply a lot of pressure. Cut the tail hair while it is held horizontally as that makes it even when the dog wags his tail. Finish off with the head and the area around the ears. Here, you can use the rounded shears and the comb. Comb up hair and shave what lies on the top part and not more than that. If you are using scissors, make sure they are oiled and sharp for best results. Also, ensure you are firm and confident at it so that you do not tremble while using them. Follow the same procedure starting with the body, belly, legs, tail, and finally the head area. 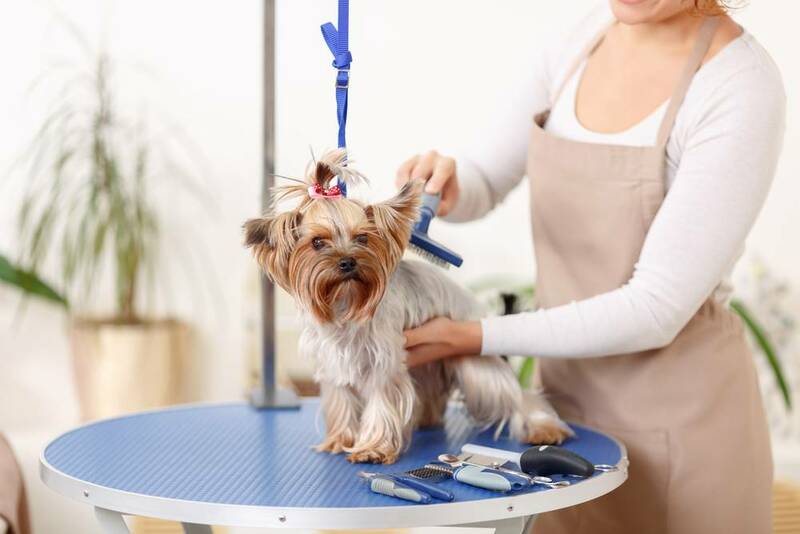 Be careful if your dog is playful because one little distraction will cause an accident that’s why with a grooming table they usually have straps to keep your dog still and in the same place. Use either your fingers or the comb to hold up hair to see if it is even. Be careful at the paw area as it can be sensitive. It is advisable that you use a number thirty or forty blades to safely shear his paw area. Step five: Brush. Having finished shaving, brush your dog ever gently all over the body, to smooth the remaining fur. You could oil him and add a little massage to complete the exercise. It is not easy to groom a dog for starters, but with practice, it becomes more and more natural. 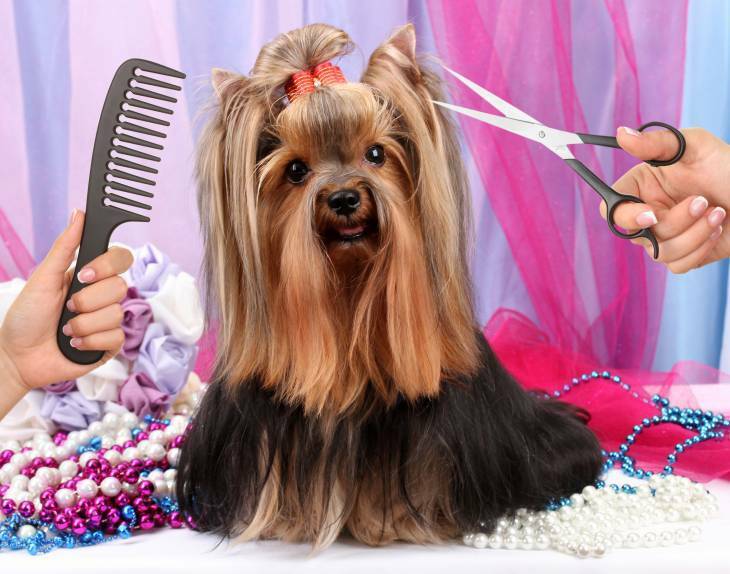 You can use pet groomers’ services as you learn and perfect it, but ensure they do it in your presence. Some pet groomers can be rough, and that will make your dog hate grooming completely. It is also okay to give your dog a break in between so that he relaxes because he can get anxious during the entire process and make it hard for you. Repeat the process every time your dog’s hair reaches a length that is hectic to maintain. Remember to give your dog enough drinking water and a balanced diet every day to promote active and healthy hair growth. Large Dog Beds for Giant Dog Breeds: How to Pick the Best Bed? Common Bath-Time Mistakes Pet Owners Make: What You Need to Avoid?